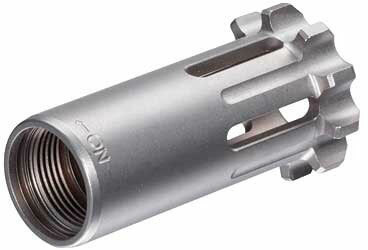 A single Evolution 9 or Ti-RANT 9 silencer can be used on a variety of host firearms with different barrel threads by quickly and easily swapping out the threaded A.S.A.P. piston in the rear of the silencer. All Evolution/Ti-Rant Series Pistons feature heat treated stainless steel construction, a matte bead blasted finish, and engraving to identify the thread diameter, pitch, and direction of rotation for installation (Left Hand threads or Right Hand threads).